I will not receive any economic benefit in case somebody should click one of the links (e.g. to Amazon) and order a CD from there. These non-profit links to the CD stores are available merely as a service to help you quickly find CDs that you wish to buy. Some of the CDs listed in this discography are certainly not available anymore. However, it might still be possible to obtain a copy by trying the links that I provided for each CD. Special thanks to Dr. Peter Ackermann for his invaluable help in providing all required information on the song discs. 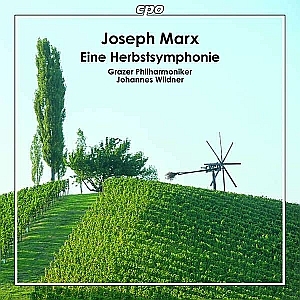 Also, I wish to thank Mr. Marko Ikonic, webmaster of www.cinemusic.de, for providing links to a couple of reviews of the Marx Orchestral Works series. Recorded in April 2003, released by ASV Classics in 2004, re-released by Naxos in 2019. Recorded in June 2002, released by ASV Classics in 2003, re-released by Naxos in 2018. Recorded in June 2018 in Graz/Austria, released in Jan. 2019. CHAN 10505 [approx. 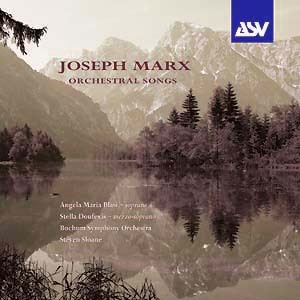 72'00]: The complete choral-orchestral works and the complete orchestral songs for high voice by Joseph Marx. 4 choral works (world premiere recordings; total time: 40 minutes): "Herbstchor an Pan", "Ein Neujahrshymnus", "Berghymne" and "Morgengesang", coupled with 12 orchestral songs (total time: 32 min.). The BBC Symphony Orchestra conducted by Jiri Belohlavek, with Christine Brewer, soprano (orchestral songs) and the BBC Symphony Chorus (choral works). Recorded in May/June 2008, to be released in January 2009. To learn everything about the genesis of this project please click here! Reviews will be available as of January 2009! cpo 77732022 [63'06]: Three Symphonic Poems by Joseph Marx: "Feste im Herbst" (World Premiere Recording; this symphonic poem is based on the final movement of the HERBSTSYMPHONIE! ), "Eine Frühlingsmusik" and "Idylle". Vienna Radio Symphony Orchestra conducted by Johannes Wildner. Recorded in March 2007, released in September 2008. ASV CD DCA 1174 [72'46]: Complete Orchestral Music Vol. 4, "The Piano Concertos": "Romantisches Klavierkonzert" (Romantic Piano Concerto) and "Castelli Romani" for piano and orchestra. Performed by David Lively (piano) and the Bochum Symphony Orchestra conducted by Steven Sloane. Recorded in January 2004 (Producer: Miguel Kertsman). The liner notes (booklet) that were originally written by the author of this website in his mother language (German) are available here. Information on the genesis of this CD can be found here. More reviews will be available soon! For further information on Sanctuary (ASV) check ASV's Homepage. ASV CD DCA 1158 [76'45]: Complete Orchestral Music Vol. 3: "Alt-Wiener Serenaden" ("Old Vienna Serenades") for large orchestra and the two string orchestra works "Partita in modo antico" and "Sinfonia in modo classico" performed by the Bochum Symphony Orchestra conducted by Steven Sloane. Recorded in April 2003 (Producer: Miguel Kertsman). The works for string orchestra are Marx's own arrangements of his exquisite string quartets "in modo antico" and "in modo classico". ASV CD DCA 1164 [56'35]: Complete Orchestral Music Vol. 2: "The Orchestral Songs". Angela Maria Blasi (soprano) and Stella Doufexis (mezzo-soprano) with the Bochum Symphony Orchestra conducted by Steven Sloane. Recorded in September 2003 (Producer: Miguel Kertsman). The orchestral scores of some of these songs were used as film music in the movie "Cordula" (1950). More information and pictures of this movies's cinema magazine can be found here. The liner notes (booklet) that were originally written by the author of this website in his mother language (German) are available here. The booklet includes the English translation of my notes and the song texts (German and English). Information on the genesis of this CD can be found here. 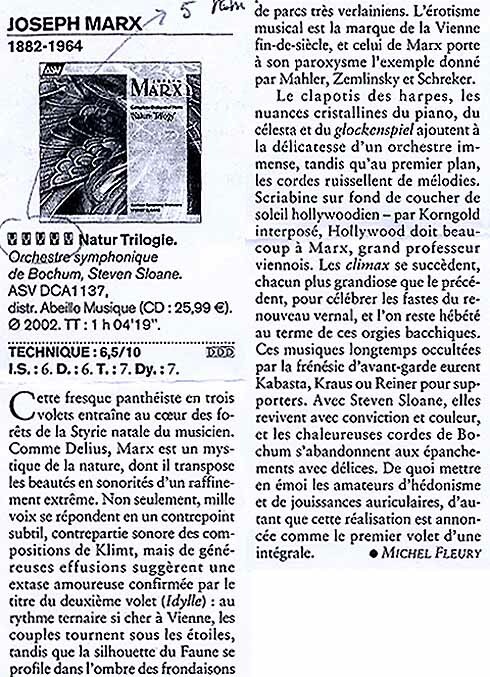 Category 103: "Best Classical Vocal Performance"
Review in Diapason France (December 2004 issue; French). 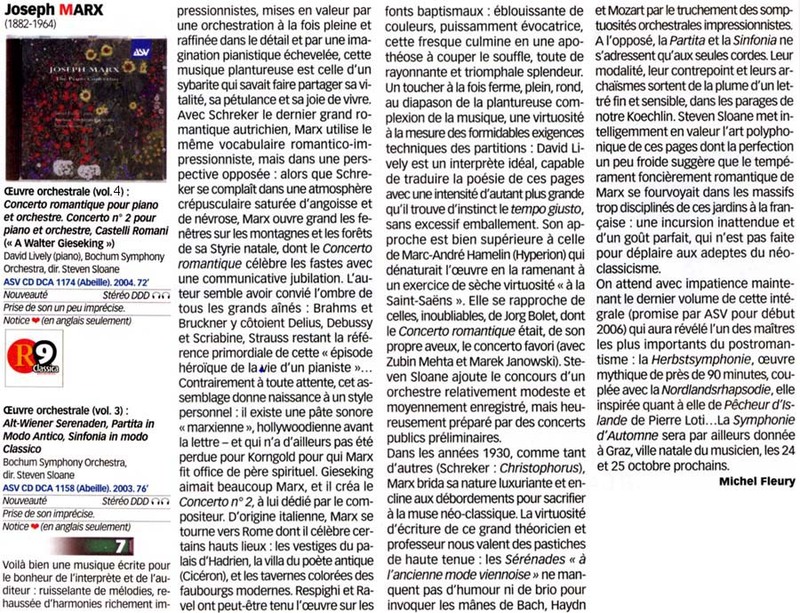 Please click here to read the German translation of this review. Review by Bob McQuiston (Tower Records) "...one of the most memorable Lieder discs released this year"
BBC Music Magazine (Erik Levi): Five Star review in the July 2003 issue. "...a performance of stunning beauty and conviction supported by suitably opulent engineering." 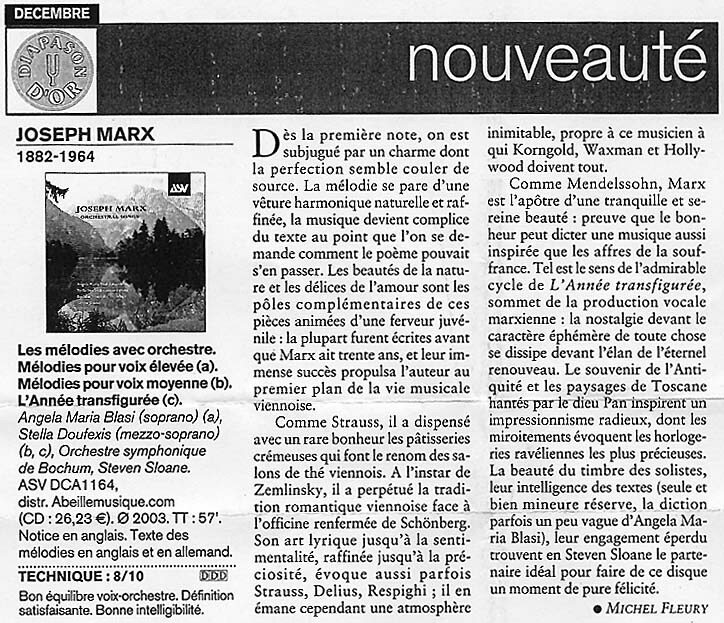 5 Stars out of 6 in Diapason France (July/August 2003 issue; French). The "Golden tuning fork" (6 stars) is virtually impossible to reach for late-romantic music of the 20th century. Please click here to read the German translation of this review. Awarded "Recording of the Month" by MusicWeb UK (Rob Barnett). According to the reviewer, this music is "unambiguously the work of a nature ecstatic. The music is discursively rhapsodic, sunny, bold, soused in melody and eloquent with the voices of nature. An impressionistic South German voice soaked in the quintessence of lyrical expression." 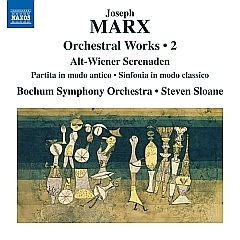 This superb disc of world-premiere recordings showcases the lush Viennese orchestral music of Joseph Marx. Hailed on his 70th birthday as "the most prestigious Austrian composer of this era", Marx was a hugely popular composer during his lifetime, but has been unjustly neglected since. 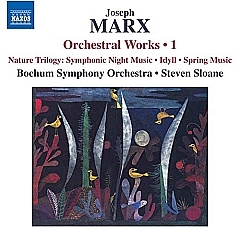 Volume 1 in ASV's new series of Marx's Complete Orchestral Music demonstrates why his music was so well-loved, and so deserving of attention now: the heady, picturesque sound-world is truly intoxicating. 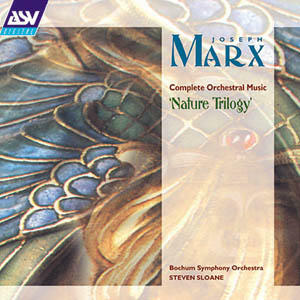 The Nature Trilogy was written during the inter-war years just as Schoenberg's 12-tone technique was emerging, but Marx rejected serialism and pursued a more sensuous style, reminiscent of Richard Strauss's tone-poems and the orchestral colours of Debussy. The result met with great acclaim at the time and is still hugely appealing today. The Symphonic Night Music opens in the garden of Eden where shimmering moonlight bathes the scene in a mystical atmosphere. The bewitching Idyll pays homage to Debussy's "Prélude à l'après-midi d'un faune", while the Spring Music evokes nature reawakening. The combination of these three works forms a highly seductive collection, with passionate yet precise performances from the Bochum Symphony Orchestra under Steven Sloane. HYPERION CDA66990 [64'39]: The "Romantisches Klavierkonzert" (Romantic Piano Concerto) in E major [36'39], coupled with the Piano Concerto in C sharp for the left hand (1922, 27'35) by Erich Wolfgang Korngold (1897-1957), performed by Marc-André Hamelin (piano) and the BBC Scottish SO conducted by Osmo Vänskä, recorded 19/20 June 1997. Preiser 89031 [74'18]: 1 orchestral song ("Marienlied"), coupled with songs and arias by Mozart, J. S. Bach, Händel, Strauss, Flies, Mahler and Schumann. The "Marienlied" is performed by Elisabeth Schumann (soprano) with Vienna State Opera Orchestra conducted by Karl Alwin. Recorded in 1928. TESTAMENT SBT 0132 (10 CDs): The EMI Record of Singing Vol. 3 (1926-1939), including 1 orchestral song ("Marienlied") by Marx, coupled with songs and arias by a huge number of other composers. The "Marienlied" is performed by Elisabeth Schumann (soprano) with Vienna State Opera Orchestra conducted by Karl Alwin. Recorded in 1928. 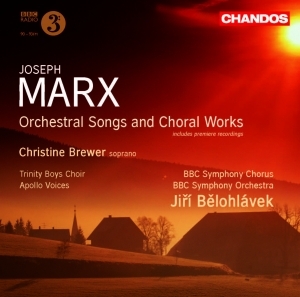 The recording of Marx's orchestral song is the same as on the disc above. GEMM CD 9379: Elisabeth Schumann sings Richard Strauss, Reger, Händel and Marx, including 1 orchestral song ("Marienlied") by Marx. The recording of Marx's orchestral song is the same as on the two discs above. Dabringhaus und Grimm (Audiomax) 703 1844-2 [62'46]: "Trio-Phantasie and Ballad for Piano Quartet". Performed by Trio Alba: Livia Sellin (violin), Philipp Comploi (cello) and Chengcheng Zao (piano) with the assistance of Wen Xiao Zheng (viola) as guest musician. Recorded in December 2013.
cpo 777 857-2 [62'06]: "Trio-Phantasie and Wildgans Songs". Performed by Hyperion Trio and Guests: Hagen Schwarzrock (piano), Oliver Kipp (violin), Katharina Troe (cello), with Simone Nold (soprano), Christoph Renz (flute) and Felix Schwartz (viola). Recorded in February 2013. Preiser Records PR91255 [53'27]: "Spät(e) Romantik (Late Romantic Music): Frühlingssonate (Spring Sonata) by Joseph Marx and Violin Sonata by Richard Strauss". Performed by Lidia Baich (violin) and Matthias Fletzberger (piano). Recorded in Vienna, March 2014.
cpo 777 279-2 [62'26]: "Works for Piano Quartet" (Rhapsody, Scherzo and Ballad). Performed by Oliver Triendl (piano), Daniel Gaede (violin), Hariolf Schlichtig (viola) and Peter Bruns (cello). Recorded in June 2009. Urlicht UAV-5996: "Klavierquartett in Form einer Rhapsodie" (Joseph Marx) and "Suite for 2 Violins, Cello and Piano left hand" (Erich Wolfgang Korngold). Performed by the New York Piano Quartet: Elmira Darvarova (violin), Ronald Carbone (viola/2. violin, Samuel Magill (cello) and Linda Hall (piano). Recorded in March 2012. Genuin GEN 89529 [69'21]: "Scenes — Music for Cello and Piano", presenting Marx's "Pastorale" for cello & piano in its second recording at all, the only recording currently available on the market, coupled with works by Erich Wolfgang Korngold, Paul Badura-Skoda, Stefan Esser, Federico Mompou and Frederick Delius. Performed by Michael Schlechtriem (cello) and Noriko Kitano (piano). Most of the music was recorded in January 2009.
cpo 777 066-2 [75'06]: New recording of the three String Quartets: Quartetto in modo antico", Quartetto in modo classico" and Quartetto chromatico". Thomas Christian Ensemble, Vienna. Recorded in December 2005. The booklet notes were written by the author of this website. ASV CD DCA 1073 [79'22]: The Three String Quartets "Quartetto Chromatico" (1936-37 rev. 1948), "Quartetto in Modo Classico" (1940-41) and "Quartetto in Modo Antico" (1937-38), perfomed by the Lyric Quartet, recorded 4-6 May 1999.
cpo 777 466-2 [50'47]: Angelika Kirchschlager (mezzo-soprano) and Anthony Spiri (piano): Selected Songs by Joseph Marx. Sterling cda1675 [60'36]: Der Ton - Songs by Joseph Marx. Performed by Matilda Paulsson (mezzo-soprano) and Bengt-Ake Lundin (piano). 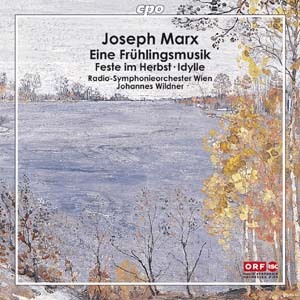 ORF-CD 3013 LC 114281 [70'40]: Joseph Marx: Songs and orchestral songs in historical recordings of the Austrian radio ORF, many of which accompanied by the composer. With Joseph Marx, Wilma Lipp, Waldemar Kmentt, Irmgard Seefried, Arleen Augér, Tonkünstlerorchester Niederösterreich and the conductor Miltiades Caridis. Click on the left image to view the track list! Berlin Classics: Christiane Karg — Verwandlung (Lieder eines Jahres") including the Marx song "Nocturne". Presenting a number of songs by other composers. Performers: Christiane Karg (soprano) and Burkhard Kehring (piano). Relief CR 3004 [79'37]: Erna Sack — The German nightingale — Recordings 1934-1949. Includes the "Marienlied" by Marx (Berlin Philharmonic conducted by Norbert Schultze, rec. 1936) and arias, songs and orchestral songs by Rossini, Verdi, Donizetti, von Flotow, Puccini, Händel, Léhar, Reger, d'Albert, Grieg, Schumann, Schubert, Taubert und Brahms. Altarus Records AIR-CD-9061 [68'16]: First complete recording of the Italian Song Book after Paul Heyse (17 songs), coupled with 12 other Marx songs. Sarah Leonard, soprano; Jonathan Powell, piano. Recorded in 2005. Nimbus Records [??'?? ]: John Charles Thomas in Opera & Song, including two songs by Marx and songs and arias by many other composers. Marx songs recorded on June 2nd, 1938 (Matrix: BS 030513-1). Preiser 90701 [48'00]: "Songs of the Jugendstil era". Three out of four Marx songs after poems by Anton Wildgans, one with violin, the second one with viola and the third one with cello. Coupled with songs by Schreker, Mahler and R. Strauss. Performers: Brigitte Prammer (soprana), Manfred Schiebel (piano), Bernhard Biberauer (violin), Gerhard Marschner (viola), Raphael Flieder (cello) and Hermann Ebner (horn). Recorded in September 2005. PAVANE RECORDS ADW 7388 [??'?? ]: Spring Sonata (Sonata No. 2) in D Major for violin & piano (1945) and 6 piano pieces (1916). Tobias Ringborg (violin) and Daniel Blumenthal (piano). PAVANE RECORDS ADW 7378 [58'36]: Sonata in A major (Sonata No. 1) for violin & piano (1913), performed by Tobias Ringborg (violin) and Daniel Blumenthal (piano), recorded 19-20 Nov 1996. PODIUM POL-1005-2 [61'16]: Sonata No. 2 ("Frühlingssonate", "Spring Sonata") for violin and piano in D major (1945) [ca. 19 min., recorded 2 April 1954], coupled with "Four Romantic Pieces" for violin and piano by Antonin Dvorak, parts of the "Sonata No. 3 for solo violin BWV 1005" by Johann Sebastian Bach, the "Adagio" movement from the Violin Concerto No. 1 in D major op. 6 and the "Sonatine" in E minor op. 3 No. 6 for violin and piano by Nicolo Paganini; performed by the legendary Vasa Prihoda (violin), Otto A. Graef (piano) and the Bavarian Radio Symphony Orchestra conducted by Werner Schmidt-Boelcke, recorded between 1952 and 1954. The information about the name of the sonata (correct: Frühlingssonate), year of origin (correct: 1945) and the key (correct: D major) given in the CD cover sheet and in the booklet are incorrect since the producers obviously thought that Marx had only written one sonata in 1913 in A major. NEW CLASSICAL ADVENTURE NCA 60118-215 [76'24]: "Rossignol, mon Mignon" - Love Songs of the Belle Epoque und the late romantic era for Soprano, Flute and Piano, including Marx's "Pan trauert um Syrinx" (Pan mourns for Syrinx; 1916). Coupled with works by André Caplet, Maurice Ravel, Camille Saint-Saens, Léo Delibes, Jan Brandts-Buys, Georges Hüe, Albert Roussel, Philippe Gaubert, Jacques Ibert, Cécile Chaminade and Oldrich Flosman. Performed by Trio Rossignol: Heidrun Kordes (soprano), Thomas Richter (flute) and Erika La Roux (piano). Recorded 4-7 Sept. 2000. CAPPRICIO 10 462 [66'26]: "Durch Einsamkeiten" ("Through lonely places" or "Through desert lands") for mezzo-soprano, viola and piano, coupled with other songs for mezzo-soprano, viola and piano by R. Strauss, Johannes Brahms, Adolf Busch, Charles Martin Loeffler, Alexander Sergejewitsch Dargomyshski, Hermann Reutter and Charles Gounod. Performed by Mitsuko Shirai (mezzo-soprano), Tabea Zimmermann (viola) and Hartmut Höll (piano), recorded in 1993/94. Chandos CHAN 10479 [54'38]: Tonya Lemoh plays Joseph Marx. Six pieces for piano (1916) and four unpublished piano pieces. DANACORD DACOCD 649 [74'53]: Unpublished piano piece "Schmetterlingsgeschichten" ("Butterfly Stories") on the CD "Rarities of Piano Music at Schloss vor Husum, from the 2004 Festival", coupled with pieces by Haydn, Chopin, Sciarrino, Goosens, Poulenc, Grainger, Vivaldi, Liszt, Cui, Stojowski, Bortkiewicz and Harrington Gibbs. The Marx piece (first recording) was performed by Jonathan Powell, and the other pianists were Edna Stern, Marc-André Hamelin, Anatol Ugorski, Igor Kamenz, Boris Bloch, Elena Kuschnerova and Jonathan Plowright. The live performances were recorded August 21-28, 2004. Jonathan Powell performs Marx and other rarities at the Husum Festival 2004"
FY SOLSTICE SOCD 104/5 [CD1: 72'34, CD2: 79'10]: CD1: 28 songs (works for voice and piano), performed by Marie-Paule Milone (mezzo-soprano), Denis Pascal (piano) and Françoise Gnieri (alto); CD2: 6 piano pieces (written in 1916), Suite in F major for cello & piano and Pastorale for cello & piano, performed by Marie-Paule Milone (cello) and Denis Pascal (piano), recorded 15-18 Dec 1992 (CD1) and 8-10 Feb 1993 (CD2). CORONA (FERMATE) FER 30005 [65'14]: "Recital - Emmy Best-Reintges plays works for solo piano, including Marx's "Albumblatt in E Major (1916). Coupled with solo piano works by Max Reger, Cyril Scott, Wassyl Barwinskyj, Alexander Grechaninov and Kurt Hessenberg. Recorded 1961-67. Motette MOT 50911 [61'32]: "Marian Music for Soprano and Organ, with Marienlied for soprano and organ by Joseph Marx (premiere recording). Coupled with organ songs by Franz Lehrndorfer, Max Reger, Joseph Schmid, Joseph Meßner, Karl Höller, Armin Knab, Ludwig Boslet, Hans Leitner and Vinzenz Goller. Performed by Anita Bader (soprano) and Hans Leitner (organ). Recorded ???. NAXOS 8.111093 [78'51]: "Lotte Lehmann: Lieder Recordings Vol. 1 (1935-37), including one song by Joseph Marx and songs by Mozart, Schubert, Schumann, Brahms, Wolf, Balogh, Grechaninov, Worth, Sodero, Cimara, Beethoven, Hahn, Gounod, Pfitzner, Franz and Jensen. Recorded in the years 1935-37. Performed by Lotte Lehmann, soprano, and Erno Balogh, piano. 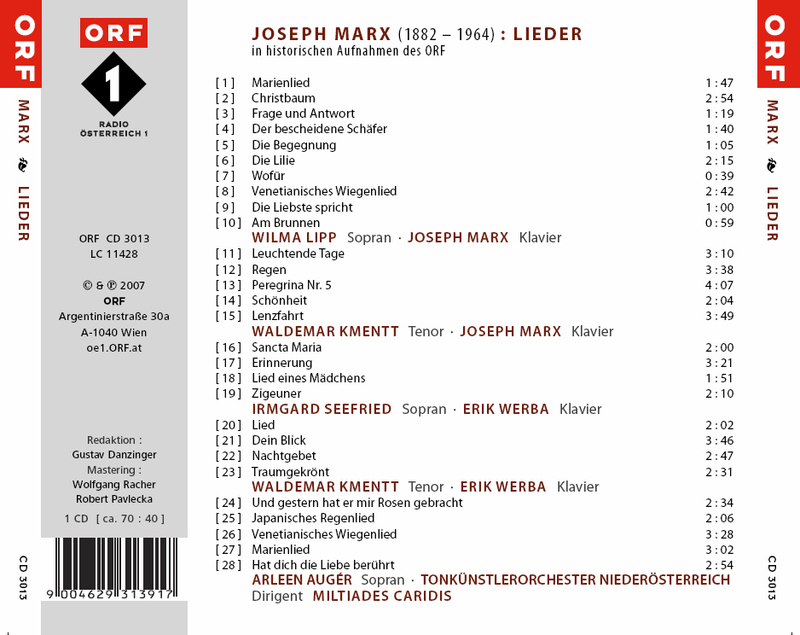 Mitra CD [60'42]: 13 songs by Joseph Marx and 11 songs by Wilhelm Kienzl. Performed by Kazumi Kohno (soprano) and Jürgen Glauss (piano). Recorded on July 29/30, 2004. For the present, this CD can only be ordered from the producer, Mr. Eco Rau. Price: 15,- Euros plus postage. MDG MDG60312342 [??'?? ]: Songs after poems by Theodor Storm, 1 song by Marx, coupled with songs of Berg, Blome, Brahms, Carrière, Détlefsen, Eggers, Eyken, Hermann, Jenner, Mandl, Marx, Mottl, Reger, Reutter, Schoeck, Schreker, G. Stolz and Trunk. Performed by Ulf Bästlein (baritone) and Charles Spencer (piano). Recorded ???. LINN RECORDS CKD 238 [58'33]: 4 songs, coupled with songs of Bruno Walter and Richard Strauss. Performed by Emma Bell (soprano) and Andrew West (piano). Recorded April 5-7, 2004. This CD is a SACD ("Super Audio CD") but can be played on any standard CD player. FY SOLSTICE SOCD 904 [58'57]: 22 songs, performed by Marie-Paule Milone (mezzo-soprano) and Denis Pascal (piano). This CD is a shortened re-release of CD1 of the difficult-to-obtain "FY SOLSTICE SOCD 104/5" double CD set (see above). DECCA 467 697-2 [72'59]: "Night Songs". 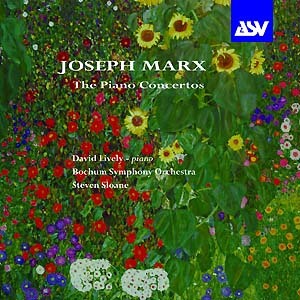 4 songs by Joseph Marx, coupled with songs by Fauré, Debussy, Richard Strauss and Rachmaninov. Renée Fleming (soprano) and Jean-Yves Thibaudet (piano). Recorded in New York in November 2000/January 2001. BMG RCA 09026 68425 2 [78'03]: Leontyne Price - Return to Carnegie Hall, 2 songs, coupled with songs by Georg Friedrich Händel, Wolfgang Amadeus Mozart, Richard Strauss, Giuseppe Verdi, Francis Poulenc, Hector Berlioz, Henri Duparc, Reynaldo Hahn, Lee Hoiby, Giacomo Puccini, George Gershwin, Francesco Cilea and Samuel Augustus Ward. Performed by Leontyne Price (soprano) and David Garvey (piano), recorded January 26, 1991 (live) at Carnegie Hall, New York City. Sony Classical CD 62866, 2 CD set: Masterworks Heritage - Ljuba Welitsch (The Complete Columbia Recordings), including 2 songs by Marx, coupled with songs and arias by numerous other composers. Performed by Ljuba Welitsch (soprano) and Paul Ulanowsky (piano). Preiser 90476, 2 CD set [??'?? ]: The Art of Ljuba Welitsch", including 2 songs by Marx, coupled with songs and arias by numerous other composers. The Marx songs are performed by Ljuba Welitsch (soprano) and Paul Ulanowsky (piano). Recorded 1947-1950. 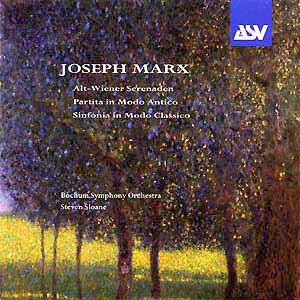 BellaVoce BLV 107.013 [75'07]: 6 songs performed by Joseph Marx himself, coupled with songs by Brahms, Schubert and Schumann, performed by Ljuba Welitsch (soprano) and Joseph Marx (piano), recorded for the Austrian Radio in 1947/48. CBC Musica Viva, MVCD 1162 [??'?? ]: 1 song, coupled with songs by Anton Webern, Franz Grothe, Mischa Spoliansky, Theo Mackeben, Frederick Hollander, Robert Schumann, Alexander von Zemlinsky, Arnold Schoenberg and Kurt Weill. Performed by Jean Stilwell (mezzo-soprano) and Robert Kortgaard (piano). Claremont (Saf) 785072 [??'?? ]: 1 song, coupled with songs by a huge number of other composers. The Marx song is performed by Florence Easton (soprano) and Gerald Moore (piano). Marston Records MA 52033, 2-CD-Set: 1 song, coupled with songs by a huge number of other composers. The Marx song is performed by Florence Easton (soprano) and Gerald Moore (piano). Same recording as CD above. Recorded in 1933. ETCETERA KTC 1044 [55'55]: 7 songs from the "Italian Song Book" and one additional song, coupled with songs by Alexander von Zemlinsky and Franz Schreker, performed by Dorothy Dorow (soprano) and Massimiliano Damerini (piano), recorded live in 1980. ETCETERA KTC 1099 [57'16]: 5 songs, coupled with songs by Hugo Wolf, Theodore Chanler, Ralph Vaughan-Williams, Roger Quilter and R. Strauss, performed by Glenda Maurice (mezzo-soprano) and Graham Johnson (piano), recorded live on January 11, 1988. ETCETERA KTC1108 [63'43]: 20 songs (works for voice and piano, 1906-11), performed by Dinah Bryant (soprano) and Daniel Blumenthal (piano), recorded in 1989. DELOS DE 3712, 2 CD set [??'?? ]: 1 song, coupled with songs by many other composers. Performed by Arleen Auger (soprano) and Dalton Baldwin (piano). DELOS DE 3029 [68'26]: 1 song, coupled with songs by Aaron Copland, Fernando Obradors, Jayme Ovalle, Richard Strauss, Francis Poulenc, Pietro Cimara, Roger Quilter, Oscar Strauss, Robert Schumann, Gustav Mahler, Joaquin Turina, Edouard Lippe, Noel Coward, Charles Gounod, Franz Schubert, Frank Bridge, Stephen Foster, Stefano Donaudy, Benjamin Britten and Frederick Loewe. Performed by Arleen Auger (soprano) and Dalton Baldwin (piano), recorded in 1992. IDENTICAL WITH THE CD BELOW. IDENTICAL WITH THE CD ABOVE. Romophone LehLo1a 81013, 2 CD set: "Lotte Lehmann - The Complete Victor Recordings (1935-1940)", including 1 song by Marx, coupled with songs by numerous other composers. Performed by Lotte Lehmann (soprano) and Ernö Balogh (piano). Recorded in New York City on March 13, 1936. Claremont GSE CD 78-50-78: "Laudate Dominum - Ursula van Diemen", including 1 song by Marx, coupled with songs by numerous other composers. Performed by Ursula van Diemen (soprano) and Arpad Sandor (piano). Recorded 1926-28. "Hamburger Archiv für Gesangskunst, including 1 song by Marx. The songs performed by Ursula van Diemen (soprano) and Arpad Sandor (piano). Same recording as CD above. Recorded in 1927. Koch Schwann CD 314002 H1 [??'?? ]: "Early songs by famous composers", including 1 song by Marx, coupled with songs by Arnold Schönberg, Ludwig van Beethoven, Alban Berg, Boris Blacher, Johannes Brahms, Gottfried von Einem, Josef Matthias Hauer, Franz Joseph Haydn, Ernst Krenek, Franz Liszt, Gustav Mahler, Felix Mendelssohn, Wolfgang Amadeus Mozart, Carl Orff, Hans Pfitzner, Max Reger, Franz Schubert, Robert Schumann, Richard Strauss, Carl Maria von Webern, Anton Webern and Hugo Wolf. Performed by Regina Klepper (soprano) and the Marx student Erik Werba (piano). Recorded in April 1987. Preiser 90343 [56'03]: 2 songs, coupled with songs by Ernst Krenek, Franz Schubert, Gerhard Wimberger, Johann Vesque von Püttlingen, Johannes Brahms, Hugo Wolf and Ernst Ludwig Uray. Performed by Oskar Czerwenka (bass) and the Marx student Erik Werba (piano). Recorded in April 1980. Preiser 89177 [74'18]: 2 songs, coupled with songs and arias by Verdi, Bizet, Saint-Saens, Wagner, Händel, Weingartner, Strauss and Bergner. The Marx songs are performed by Luise Willer (mezzo-soprano) and Carl Bergner (piano). Recorded in 1937. EMI CLASSICS 7243 5 73168 2 8 [64'55]: 5 songs, coupled with songs by R. Strauss and Gustav Mahler, performed by Katarina Karnéus (mezzo-soprano) and Roger Vignoles (piano), recorded in July 1998. EMI CLASSICS ???????? [64'55]: 5 songs, coupled with songs by R. Strauss and Gustav Mahler, performed by Katarina Karnéus (mezzo-soprano) and Roger Vignoles (piano), recorded in July 1998. Certainly same as CD above! GEGA GD 125 [47'42]: 26 songs (works for voice and piano); performed by Lyudmila Gerova (soprano) and Todor Petrov (piano), recorded in December 1991. Podium might be able to obtain a few copies of this CD from the manufacturer or the performers. Philips Classics 442 706-2, 4-CD-Set: "Lied-Edition - Von der Jahrhundertwende bis zur Gegenwart (Vol. 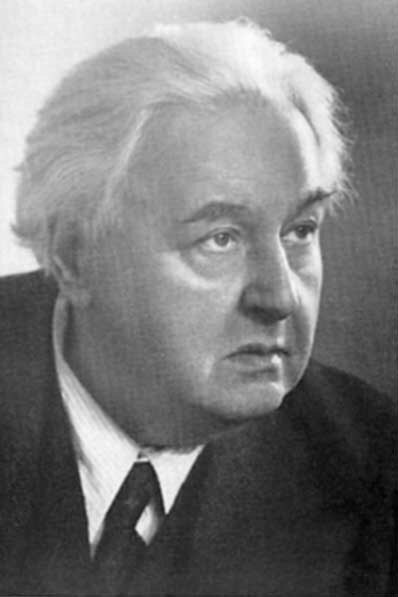 4), Hermann Prey (baritone) sings songs by Joseph Marx (on CD 3: "Der Dichter", "Nimm dir ein schönes Weib"), Richard Strauss, Hans Pfitzner, Gustav Mahler, Johannes Brahms, Wilhelm Kienzl, Felix Weingartner, Leo Blech, Paul Graener, Emil Mattiesen, Bruno Walter, Max Reger, Franz Schreker, Joseph Haas, Richard Trunk, Armin Knab, Othmar Schoeck, Erich Wolfgang Korngold, Arnold Schönberg, Anton von Webern, Alban Berg, Alexander von Zemlinsky, Josef Matthias Hauer, Egon Wellesz, Hanns Eisler, Windfried Zillig, Hans Jelinek, Paul Hindemith, Ernst Krenek, Viktor Ullmann, Mark Lothar, Boris Blacher, Wolfgang Fortner, Gottfried von Einem, Peter Zwetkoff and Friedrich Gulda. The pianists are Friedrich Gulda, Karl Engel, Michael Krist and Wolfgang Sawallisch (recorded 1976). BMP Bilkent University Symphony Orchestra CD: "An einen Herbstwald", performed by Mesut Iktu (baritone) and Julia Kerimova (piano), coupled with vocal works by Rachmaninov, P. Tchaikovsky, Richard Wagner, Giuseppe Verdi, Ahmed Adnan Saygun, Franz Schubert, Johannes Brahms, Gustav Mahler and Michail Glinka (new recording). in the Stefaniensaal in Graz, Austria. The Joseph Marx Society invites all music lovers to become a member or to support the Society with a kind donation. Please contact the General Secretary, Berkant Haydin (author of this website joseph-marx.org). www.joseph-marx.org is a private website created by Berkant Haydin. and works of this composer and to celebrate his magic music. website of the Joseph Marx Society mentioned above.